Cubs vs. Indians in Game 5 of the World Series at Wrigley Field. CHICAGO (WLS) -- The Cubs beat the Indians Sunday night, 3-2, in Game 5 of the World Series, avoiding elimination and moving one game closer to the championship. The Cubs won a series game at Wrigley Field for the first time since in 1945. Game 6 will be in Cleveland on Tuesday night when Chicago right-hander Jake Arrieta faces Josh Tomlin. The Indians still lead the series, 3-2. Hall of Famer and Cubs legend Ryne Sandberg threw the ceremonial first pitch before Sunday's game. Pearl Jam singer Eddie Vedder sang "Take me out to the Ball Game" during the 7th-inning stretch. Former Cubs PA announcer Wayne Messmer sang both "God Bless America" and the national anthem. Tickets for some seats for Game 5 had fallen under $1,000, but tickets are still a hot commodity. While fans were lining up outside the Wrigley Field box office Sunday morning, security had to break up some scuffles and some people had to be removed from the line. Earlier Sunday, fans who were crestfallen from Saturday remained hopeful. "I'm still positive. It's very stressful, but it's still early in the series and you never know what's gonna happen," said Jennifer Purkey. "I still got faith in them" said Tiffiney Leonard. "Especially Kris Bryant"
Some sought a higher power ahead of the game. Wrigley every Sunday when the Cubs have a home game. Cubs fan Rich D'Anna got some help to get to the World Series. Thanks to dozens of friends and family, Cubs fan Rich D'Anna got to take his 13-year-old son. 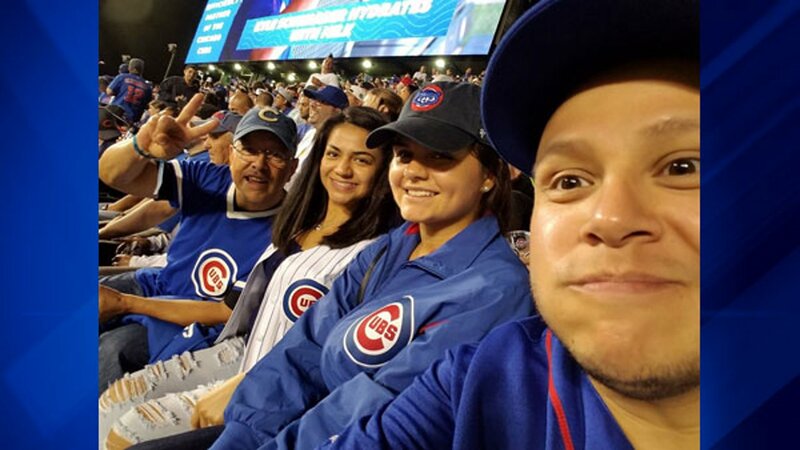 The Northwest Side native now lives in Los Angeles, and was lucky enough to book a ticket home during the World Series game. However, he couldn't afford tickets. A GoFundMe page was set up and people donated $8,000 to buy two tickets. Strict security continues to be in effect at many bars around the ballpark. A thousand officers were in the area to keep everyone safe. Saturday night, three Wrigleyville bars were shut down due to overcapacity, Yat-zees, Redmond's and Raw Bar. An additional rooftop was shut down at 3415 N. Clark. The fire department said all these business had been warned. They are working with the police department and the building department to enforce occupancy rules during the World Series games. On Friday, three bars, including Murphy's, were cited and warned. Many bars were charging huge cover fees for people to watch the games in close proximity to Wrigley Field. The city asked those bars do not serve drinks out of glass bottles or aluminum cans and just use plastic cups so that unruly fans wouldn't be able to cause much damage. Many Cubs fans were not upset and said they were looking on the bright side. Streets closures before and after the game, as well as parking restrictions, continue to be in effect. For more information on the street closures and parking restrictions, click here. The Cubs are now one loss away from elimination in the 2016 World Series.